That's us. World wide travelers. Well that is, if you count the States and Jamaica. So I guess in reality, we're not world wide travelers. But one can dream right? I've decided to embrace our small adventures to not always exciting places and be okay with it. We may not travel to exciting and exotic countries but hey, we enjoy the few places we do go. Back over a year ago now, I came across this pin on Pinterest and fell in love with the idea. I knew that I wanted to do something similar but had to wait until we had gone to enough somewhat cool places before starting the frames. We went to Jamaica in 2010, Washington D.C. in November 2013 and then Seattle this past May. Good enough for us! We chose our pictures and set out to get all three maps of all three locations. Seattle and D.C. was simple enough, but Jamaica turned out to be trickier. My awesome cousin Stacey lovingly purchased me a Jamaica map from a shop in Toronto and mailed it to me so that I could finally get around to doing this project. I found four frames (I only needed three but this leaves one open for another location) for $2 each at a local thrift store and I set to work measuring out the maps. I started this project on my own one afternoon and got a lot farther than I expected I would before Dan came home and helping me with the rest. Which ended up being a good thing since he is way more patient than me and better with measurements and cutting. We chose what part of the map we wanted to show and then folded it to fit into the frame. I wanted to make sure I was 100% happy with my choice before actually cutting the map up. Once we both agreed on the placement of the picture, Dan carefully cut the rectangle out of the middle of each map section while I cleaned the frames. Once we got going, we actually made good progress and all three frames were ready to go by the end of the evening. I wanted to hang them immediately but Dan suggested we wait until the next night when we had fresh minds and could actually spend the time needed to place them nicely. Plus, I wasn't sure where I wanted them. We decided to put them along the wall beside the stairs leading to the basement. We are actually running out of wall space in our house to hang new things, which is slightly concerning. What about all future projects I want to do? Now I apologize for the crappy quality of these finished project pictures. It's really hard to get good lighting in the basement without fighting reflections. I did the best I could with the camera and light I had, so you'll just have to go with it. It looks better in person and I'm pretty delighted with how well it turned out. If you want to see how nice it really looks, you'll just have to come and visit me. So that is the most recent project that we've been working on around here lately. It was quick and easy, despite the months of waiting to get the map and then actually get around to putting together all the pieces. What do you think? Fun idea? Where should we go next for our world wide traveling? I'm thinking the Grand Canyon. SUCH a cute idea!! I hear you on the filling-up-walls! we actually have a basement stairwall similar to yours, I think I've just found my next project to fill it!! I love them! 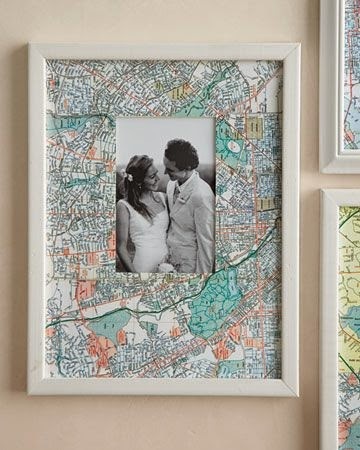 Reminds me of my framed maps!! Kate - You can totally copy me and do this project for your stairwell! Let me know if you do and you can share pictures. Neat idea - I love maps! What a neat idea! If I ever get to go on the trips T does, I'm definitely doing this one. Love the idea, love the placement, love you! Furry Gnome - Maps are pretty cool. Although we never really use them anymore, since we can access directions on our phones. We should pick them up more often and I should practice my navigational skills. Stasy - You definitely should try and go on some trips so you can make these cool frames to show off the places you've been! It took us 4 years before we had been to 3 cool places, so you should be able to make your first set of frames by 2018! Karen - Thanks! I'm really happy with how they turned out.